This Cheesy Chicken Parmesan is a delicious Italian dish of breaded chicken, topped with marinara sauce and lots of cheese. Get this restaurant quality favorite Italian dish right at home. Crispy on the outside, juicy on the inside, this cheesy chicken will become a family favorite! 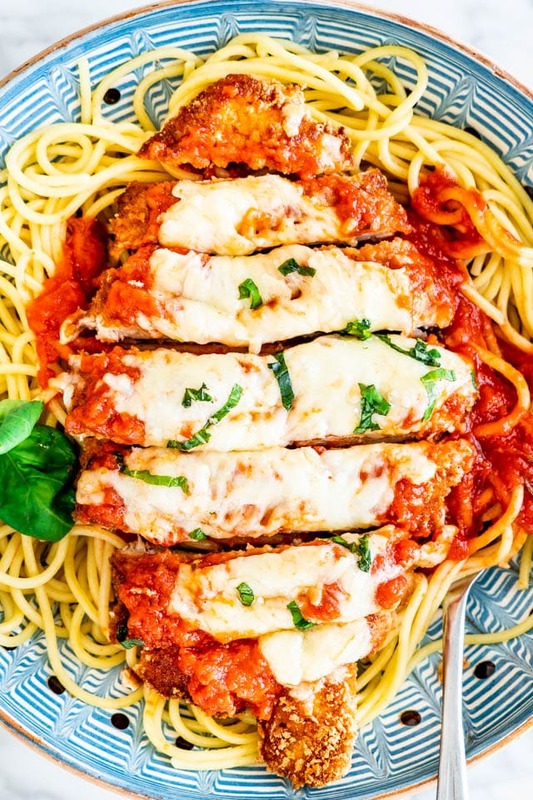 Chicken Parmesan is such a classic and one of those Italian dishes that everyone loves. The chicken is perfectly golden and crispy on the outside, but still juicy on the inside, topped with marinara sauce and lots of cheese. This chicken is worth every single minute it takes to make! It’s one of the most loved and most ordered Italian dishes for a reason. Chicken parm has gone from being a beloved and once-a-year comfort food to an institutionalized, mass-produced staple. While there are hundreds if not thousands of recipes out there, here’s my favorite. It’s easy, simple and a classic! 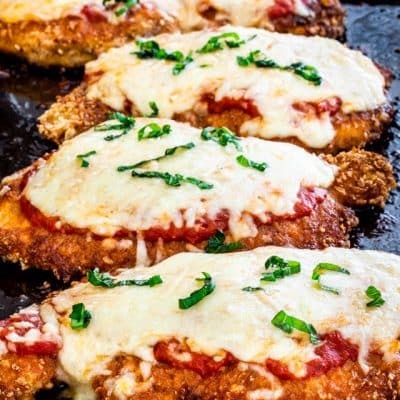 Chicken Parmesan also known as Chicken Parmigiana is a dish consisting of breaded chicken that’s pan fried then covered in tomato sauce, mozzarella, parmesan cheese or provolone and baked until the cheese melts and is bubbly. It’s usually served over pasta or with a side salad. Eggplant Parmigiana is the original Italian recipe which is prepared the same as chicken. Eggplants are lightly breaded, pan fried, topped with fresh tomato sauce and Parmesan cheese, and then baked. It is believed that the switch to chicken in the United states might have been because Italian restaurant owners saw that Americans preferred meat over eggplant. Personally I love the chicken version, but if you’re looking for a vegetarian version, eggplant parmesan is great! Flour – all-purpose flour is what you need, though you can use whole wheat flour. Breadcrumbs – I love to use a combination of regular Italian breadcrumbs and Panko breadcrumbs because they make the chicken extra crispy. However, you can stick to using just Italian breadcrumbs. The breadcrumbs can be the plain ones or the ones that come pre-seasoned. Cheese – we need lots of mozzarella cheese and parmesan cheese. I also love using a little bit of grated parmesan cheese for the breading to give some extra flavor to it. Eggs – you’ll need a couple large eggs. Olive oil – for pan frying the chicken. Marinara sauce – I usually buy a good organic marinara sauce but you can also make your own if you prefer. Basil – to garnish at the end. Fresh basil is the best. If you don’t like the taste of basil, you can skip it. 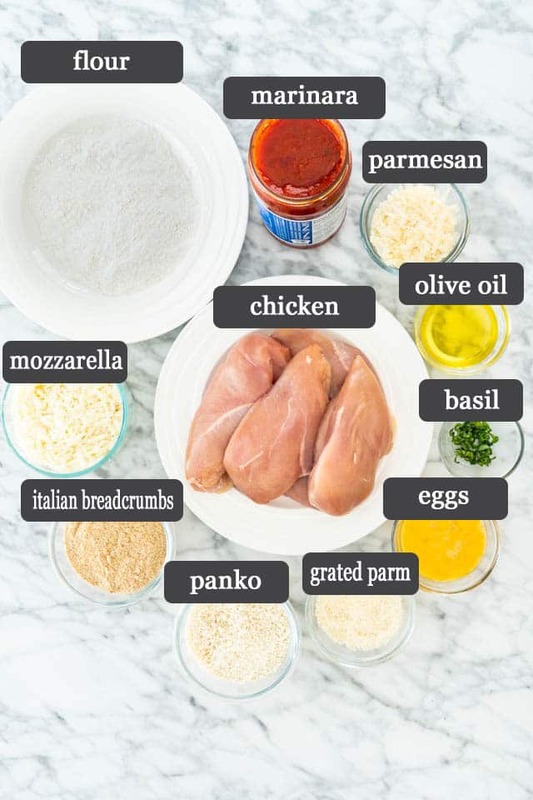 The chicken: Chicken Parmesan is usually made with chicken breast. I like to take the breasts and place them between two pieces of parchment paper then pound them using a meat mallet until nice and thin. Alternatively, you can cut the breast in half horizontally. Totally up to you which method you prefer. 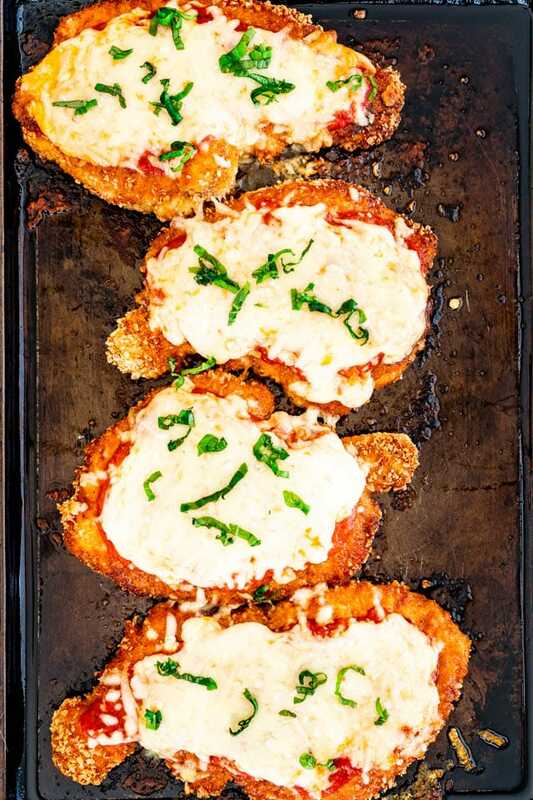 The Breading: This is an important step to making chicken parm. Dredge the chicken through flour, then eggs and finally the breadcrumb mixture. For the breadcrumb mixture I like to combine Panko breadcrumbs, Italian breadcrumbs, grated Parmesan cheese and salt and pepper. I love the extra crispiness that the Panko gives. The Frying: If you want to make a true authentic recipe, the frying is necessary. It’s the only way you’re going to get the juiciest chicken. Make sure you’re frying right. Heat the oil in a skillet first, the temperature should reach anywhere between 375 F degrees to 400 F degrees. Fry in batches if your skillet isn’t big enough. I usually do 2 at a time if using my big 12 inch cast iron skillet. The Toppings: Cheese and sauce. I love using a good organic marinara sauce. Top with as much sauce as you like. Some like more while some like less. I prefer my chicken parm smothered in sauce, but it’s up to you. Sprinkle with lots of cheese. I love using a combination of freshly shredded mozzarella cheese and freshly shredded parmesan cheese. The Baking: Bake the chicken in a preheated 425 F degree oven just until the cheese melts. Should take about 20 minutes. Yes, you can. Although chicken breast is usually used, you can use chicken thighs. Chicken thighs are usually way juicier and more flavorful than breast, not to mention they’re usually cheaper. I would still go ahead and pound them so they’re thinner with a meat mallet, then follow the rest of the steps as instructed. Don’t skip the dredging. It’s inevitable, it’s a must when it comes to chicken parm. The dredging is what makes the chicken crispy. Frying the chicken is the best way to keep it moist. Again, a must! Use fresh mozzarella. While I’ll be the first to admit, I buy the shredded kind many times, nothing beats the taste of freshly grated fresh mozzarella. My favorite way to serve this is over a large bed of cooked spaghetti. Add some cheesy garlic bread for a complete meal! When running out of options, mashed potatoes are always the perfect side dish! You can also serve it with a side salad or some roasted veggies such as roasted broccoli or roasted brussels sprouts. Refrigerate leftovers in an airtight container for about 3-5 days. In my house, leftovers don’t last longer than a couple days. 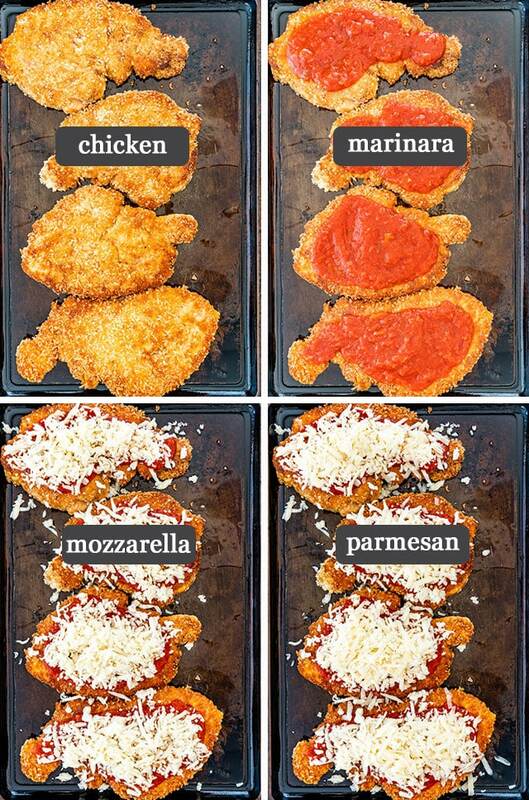 The chicken parmesan would probably store longer if you kept the sauce separate from the chicken breasts. The breading tends to become saturated and soggy from the sauce when you reheat it in the microwave or oven. Bread the chicken and fry it as instructed, let it come to room temperature then place it on a baking sheet and transfer it to the freezer. Freeze it for a couple hours until it freezes completely. Take the chicken out of the freezer and transfer it to an airtight container and freeze for up to 3 months. Freeze the sauce in a separate airtight container and the cheese in a freezer bag. When ready to serve, take the frozen chicken out of the freezer and follow the recipe instructions for assembly. Bake for about 35 to 40 minutes. It will take a bit longer to bake since cooking chicken from frozen. 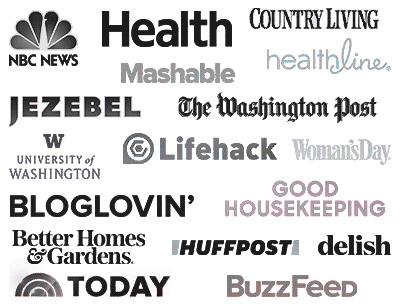 Baked Chicken Breast – crazy fast and easy! This Chicken Parmesan is golden, crispy on the outside, juicy on the inside and utterly delicious! Preheat your oven to 425 F degrees. Prepare chicken: Place the chicken breasts, one at a time, between two pieces of parchment paper. Using the flat side of a meat mallet, start pounding the chicken until it's about 1/2 inch (1 cm) in thickness. Repeat with remaining breasts. Prepare flour and breadcrumbs: Place the flour in a shallow plate, same with the eggs. In another shallow plate, combine the breadcrumb mixture together. Dredge chicken: Dredge the chicken through the flour, one piece at a time, making sure it's fully coated on both sides, then dip into the egg mixture. Dredge through the breadcrumb mixture on both sides. Transfer to a baking sheet and repeat with remaining chicken breasts. Fry chicken: Preheat the oil in a large skillet or frying pan. Make sure the oil is hot enough, between 375 F to 400 F degrees. Fry the chicken in batches. Add two pieces of chicken at a time and brown on both sides until golden, about 4 minutes per side. Repeat with remaining chicken. 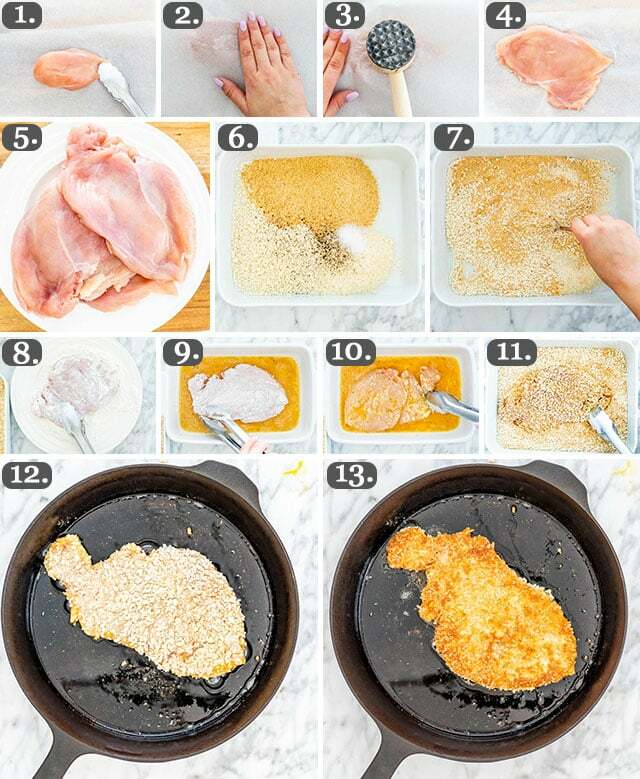 Assemble the chicken: Place the fried chicken on a baking sheet. Top each piece of chicken with about 1/4 cup of marinara sauce. Use more if preferred. 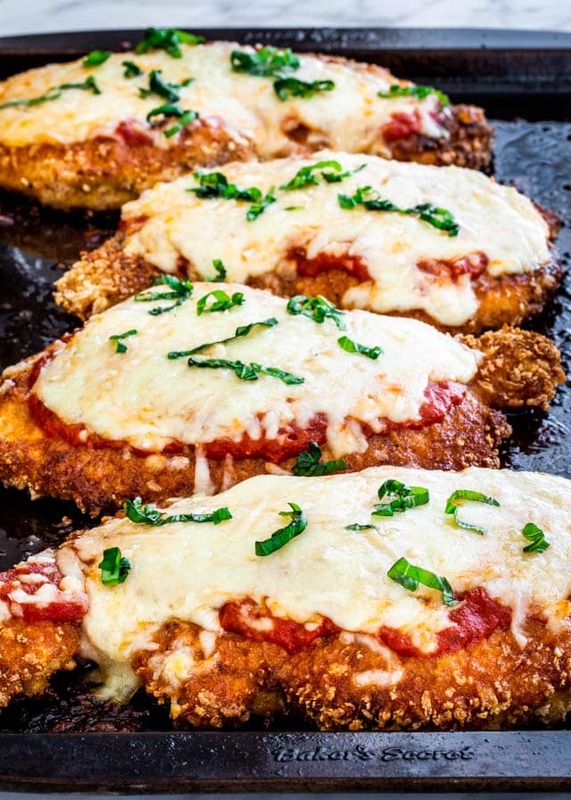 Top each chicken with 1/4 cup of mozzarella and 1/4 of the parmesan cheese. Bake: Transfer the baking sheet to the oven and bake for about 20 minutes or until the cheese has melted and is bubbly. Sprinkle with basil and serve over spaghetti. Leftovers: Refrigerate leftovers in an airtight container for about 3-5 days. Nutrition: Nutritional information is based on 1/2 a breast, since these are really large pieces of chicken, especially after they've been pounded. 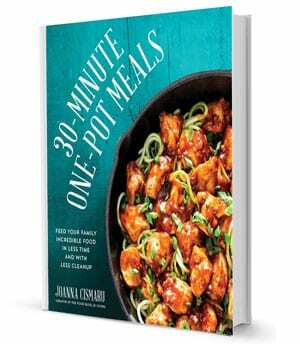 Also this recipe assumes that each piece of chicken is 8 oz, so 4 oz of chicken breast per serving. I made this for dinner last night and WOW! It was fantastic. Between you and Nagi, my recipe binder is getting very full. Thank you, thank you, thank you!!! I saw the recipe this afternoon, and headed to the grocery store for fresh chicken; I used thighs and followed the recipe to the letter. I seasoned with salt, pepper and a little garlic powder. It came out perfect. Crispy, yet incredibly tender and juicy. This is very easy to make. I’m so glad you liked it! I love that you used chicken thighs! Can one use gluten free flour, breadcrumbs?